The following are coupon codes that can be used on GoDaddy.com. Please note, you can only use 1 coupon at a time. If you buy multiple items, such as domains with different endings, it might be best to make separate transaction, so that you can use a domain specific coupon to maximize your savings. Also make sure you don’t end up overpaying. GoDaddy is very sneaky when it comes to up sells or domain registration duration. If for some reason you end up with a checkout cart of $50 or more, please read below on how to avoid that. The coupon can be applied on the last step before heading to the checkout page. The coupon box is at the top right inside the “total cost” box. Often GoDaddy will automatically apply a coupon code already, which you will have to remove first by clicking the “remove” button. Once removed you can re-enter your new code. 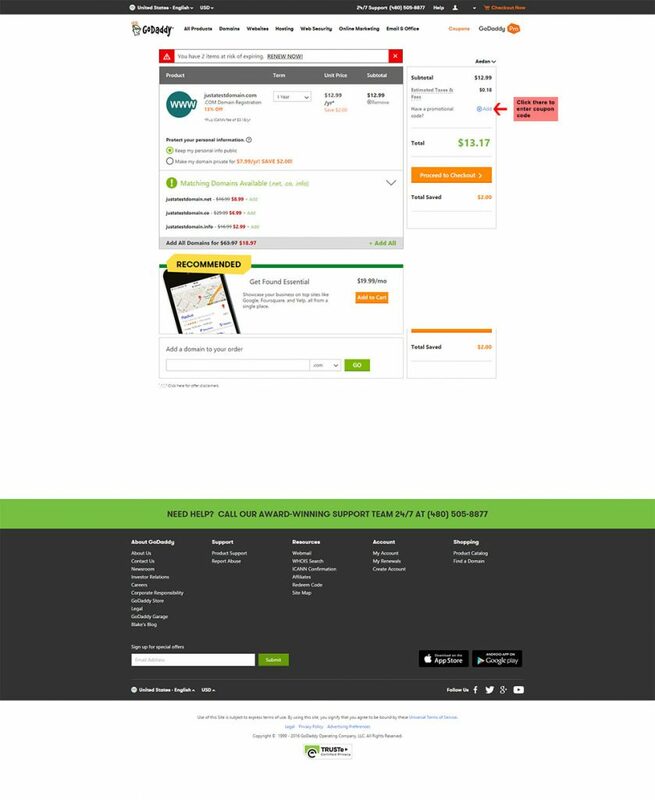 GoDaddy is famous for their up-sells during the checkout process, even worse is, that almost all up sells are unnecessary and people who are new to owning a domain might end up spending $150 instead of $5. This is about the only option that you might want to consider when registering a domain. By default, your personal information that you use when registering a domain (Name, Address Email) can be looked up in the domain database. I personally don’t use this, as I never had any bad experience with this over the 15 years I have been registering domains. If you want to spend an additional $8/year to hide your name,address and email, feel free to do so. Big no no! Trust me, you don’t want either of those. The website builder is a tool that let’s you create your own website. Sounds good right? Well, their website builder is pretty bad, in every way. There are so many free and better alternatives out there, such as WordPress, which I am using on this website you are reading right now. Then there is also the web hosting option. While yes, you might need web hosting, if you do not already have a web hosting account, you certainly want to stay away from GoDaddy web hosting. This is not to be confused with domain hosting. A web hosting account is where your actual files of the websites are hosted, and domain hosting is where you register your domain. GoDaddy is great for domain hosting, but terrible for web hosting. Why? It’s simple, their server performance is horrible, support is bad and there are cheaper alternatives out there. 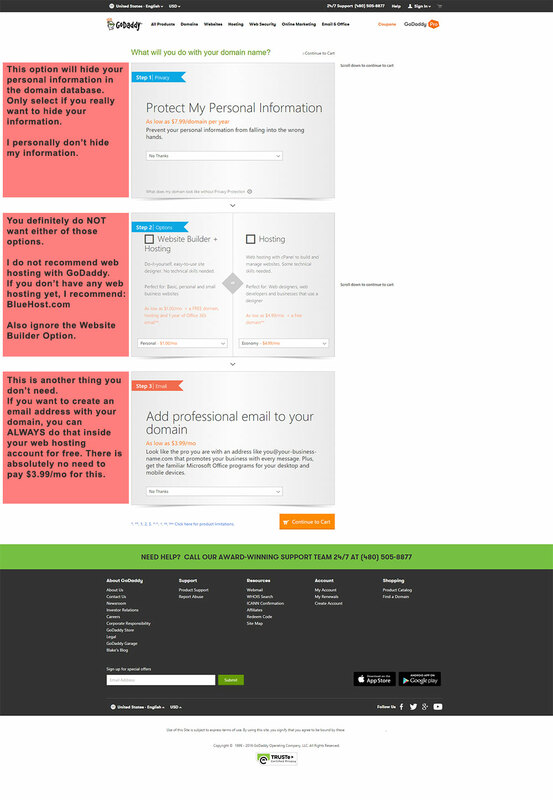 There is no reason to get GoDaddy web hosting. 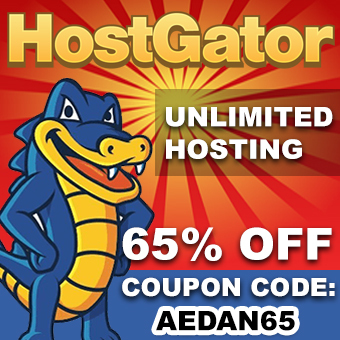 GoDaddy web hosting is known to be among the worst performing hosters our there. On Flippa.com you will find many website sellers who will plainly refuse to transfer a website to GoDaddy web hosting, because it always times out, crashes and just runs very unstable. Every time I have a customer who wants me to transfer their website to GoDaddy, I cringe, because I know instead of 5 minutes, it might take 2-3 hours with multiple issues. If you don’t have a web hosting account yet and need one, I recommend BlueHost.com. Read my article here: Web hosting recommendation. I find this option highly misleading, as it gives the impression you cannot use your domain to create email addresses unless you pay $3.99/month. You can of course always use your domain to create email addresses, for free! This can be done inside of your cPanel account of your web hosting account. There is no need to pay GoDaddy $3.99/month to use their email servers, when you get it for free with your web hosting account anyway. One of the most common reasons you will a high price on checkout, is because GoDaddy might set your domain registration period from a 1 year duration to 5 years or more. On the checkout page, next to where your domain is listed, you will see a drop down menu, where you can select the registration period (1-10 years). I recommend you register your domain on a yearly basis. Why pay 5 years up front, if you don’t get any discount anyway? Not only that, but every now and then GoDaddy hands out renewal coupon codes, which you can use next year when renewing the domain, to get another great discount. This way you might even get it cheaper again for the follow up years. The only reason I can think of to use long domain registration periods, is if you have a hugely valuable domain, and you are afraid that you might forget to renew your domain in a years time. But even in this case, you can still set your domain to renew automatically, and if there is a problem with your billing, GoDaddy will contact you in advance, to let you know about your domain renewal. Should the worst case scenario happen, that you miss the deadline to renew your domain, don’t worry, you can still renew the domain up to 12 days after it expired without any penalty fee. The domain itself will not be deleted until after 42 days of it’s expiration date. Between day 12 and 42 after expiration, you can still get the domain back by paying a penalty fee. After day 42, the domain will be deleted and shortly thereafter can be re-registered by anyone.